Step 2: Follow instruction from article which explains step by step approach to create PDF Document on Fly in C#. This post will explain you How to remove HTML from String. To Remove HTML from String you can make use of following function. Many articles are discussing about advantages of using Session StateServer or SQLServer over InProc Mode. One basic reason why I choose StateServer Mode is when your website is running on Third Party Hosting than you will notice that Session Timeout can occur anytime depends on load of traffic on your server. If your website has large number of visitors and session timeout can cause problem, It is better to change Session Mode Session="InProc" to Session="StateServer". 1. Session is persistent and reliable. 2. Avoid Session Timeout due to Memory shortage on server (IIS Setting). 1. Poor Performance compare to Session="InProc"
2. Session_End Event would not fire. Steps for changing Session InProc Mode to Session StateServer Mode. 2. Select Asp.Net State Service. 3. 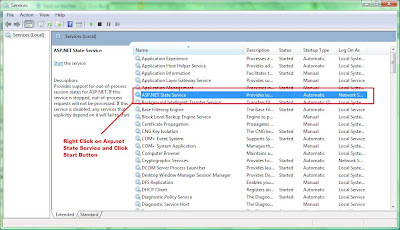 Right Click on Asp.net State Service and choose start from popup menu. If you forget to Start Service you will receive following error. Exception Details: System.Web.HttpException: Unable to make the session state request to the session state server. Please ensure that the ASP.NET State service is started and that the client and server ports are the same. If the server is on a remote machine, please ensure that it accepts remote requests by checking the value of HKEY_LOCAL_MACHINE\SYSTEM\CurrentControlSet\Services\aspnet_state\Parameters\AllowRemoteConnection. If the server is on the local machine, and if the before mentioned registry value does not exist or is set to 0, then the state server connection string must use either 'localhost' or '127.0.0.1' as the server name. Note: You can adjust timeout minutes based on your requirement. Let the tcpip server to be localhost i.e. 127.0.0.1. Most webhosting company uses these settings unless you have different IP for StateServer and You are not required to change Port Number. You should make all object in your website to serializable. Note: To take advantage of Session StateServer or SQLServer or Custom Mode, object needs to be serialized. Example: If your project contains class files for creating DAL (Data Access Layer), you should append Serializable to every class definition in order to make class Serializable. Remember SQLConnection cannot be serialized. You might receive following error if you don't handle this situation. Exception Details: System.Web.HttpException: Unable to serialize the session state. In 'StateServer' and 'SQLServer' mode, ASP.NET will serialize the session state objects, and as a result non-serializable objects or MarshalByRef objects are not permitted. The same restriction applies if similar serialization is done by the custom session state store in 'Custom' mode. So to handle this situation you need to do following thing. If you are looking for quick help on clearing your doubts in Session you should refer this article. Discussion on How Session works in Web Garden, Web Farm, scenario. The IIS Search Engine Optimization (SEO) Toolkit helps Web developers, hosting providers, and server administrators improve their sites' relevance in search results by recommending how to make them more search engine-friendly. The IIS SEO Toolkit Beta can be installed with the Microsoft Web Platform Installer 2.0 Beta for use with IIS 7.0 and IIS 7.5.